I am an avid backpacker, kayaker, backcountry skier, and all around outdoorsman. I began backpacking thirty-five years ago at the age of 10. I have hiked or camped nearly every month, year-round. I have hiked mostly in the Western part of the United States (Idaho, Wyoming, Utah, Arizona, and Montana). I have a great love for the out of doors and enjoy all the seasons of the year. I am generally a mid-weight hiker, mainly because I like to take a little extra gear to be comfortable. I have recently spent a good share of my time in the Yellowstone National Park, Grand Teton National Park, and Wind River Wyoming area. Warranty: "Our #1 priority is to make dependable outdoor products. If you are not satisfied with any Big Agnes product, return it to Big Agnes for a repair, replacement of refund. Damage due to misuse will be repaired at a reasonable charge." The Big Agnes Sleeping Giant Pad Upgrade Kit (hereafter is referred to as memory foam pad) is an open cell polyurethane foam designed to be used in conjunction with a standard self-inflating pad of varying thicknesses (dependent on the insulating properties required). The standard pad will provide the insulating properties needed and the memory foam pad will provide a soft, comfortable sleeping cushion. The memory foam pad is encased in a very lightweight fine mesh polyester fabric. This provides additional protection. The memory foam pad comes complete with a silky-to-the-touch, thin, rip-stop nylon fabric cover. There is a 62 in (157 cm) zipper on the right hand side. There is a triangular shaped wraparound closure/cover with an adjustable web strap and snap buckle. One can open the zipper and slide a self-inflating pad inside the cover with the memory foam pad on top. At the head end of this cover are two openings at each corner for adjusting air pressure in ones self-inflating pad. 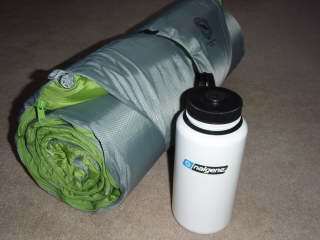 The Big Agnes Sleeping Giant Pad Upgrade Kit (hereafter is referred to as memory foam pad) arrived wrapped in a clear protective plastic sleeve. It was not rolled to maximum compression, unlike most pads you see at the store. This could be done to avoid possible damage of the memory foam from being compressed for an extended period of time. I was very interested in this memory foam pad as it is the first I have seen for backpacking purposes. The pad, mesh cover and outer cover appear to be very well constructed and include ample room for placement of ones self-inflating pad. It appears that one could leave the self-inflating pad, including the memory foam pad, inside the cover and roll-up for carrying. The strap and buckle are plenty long enough to allow easy closure, even if both pads are rolled together. The compressed circumference size of the memory foam and cover is approximately 6 in (15 cm). Included on the shipping invoice was a note "Thanks for testing Big Agnes, call for any questions", contact name and phone number. I thought this was a nice gesture from Big Agnes. 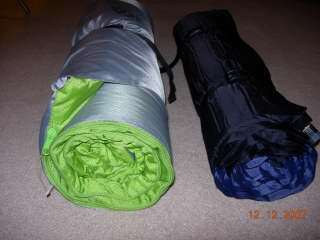 I would like to thank Backpack Gear Test and Big Agnes for the opportunity to test the Sleeping Giant Pad Upgrade Kit. The first two times I used the memory foam pad were in the Idaho Falls, Idaho area. Idaho Falls has an elevation of 4,700 ft (1,433 m) above sea level. The first night, the skies were overcast with a forecast of light snow, so the temperature should not drop dramatically. I decided to sleep in my TNF Trek Bivy shelter. When I went to bed, the temperature was about 35 F (2 C). On the second outing three days later, the night skies started out overcast and the temperature was warm, 27 F (-3 C). However, as the night progressed, the sky became clear and the temperature dropped to 7 F (-14 C). The next trip was a cross-country skiing/snowshoeing trip in the Kelly Canyon Nordic Area located 26 miles (42 km) northeast of Idaho Falls, Idaho in the Targhee National Forest. The skies were clear and the overnight low temperature was -10 F (-23 C). The next trip was also a cross-country skiing/snowshoeing trip in the Kelly Canyon Nordic Area. This time, the sky was also clear, with a bright half moon lighting the sky. The nighttime low temperature was 0 F (-18 C). 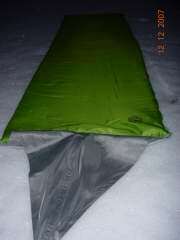 On my first outing, I used the memory foam pad inside my TNF Trek Bivy shelter. When I went to bed, the temp was around 35 F (2 C). I slept quite comfortably. The memory foam pad was very soft and conforming to my body and seemed not to be affected by the temperature. I tossed and turned throughout the night, sleeping on my side and back. When I awoke, it was snowing lightly and the temperature was 27 F (-3 C). The pad did not appear to be wet with condensation, etc. On my next outing, I slept in the same bivy. Although the temperature dropped to 7 F (-14 C) I was still more than comfortable. Still, even at colder temperatures, I slept quite comfortably. The memory foam pad seemed soft and unaffected by the temperature. This time, the pad had water droplets on the nylon cover. The fabric did not soak up the condensation and I was able to shake off the droplets. On my first trip into the Kelly Canyon Nordic Area, the overnight low temperature was -10 F (-23 C). We slept in the Warming Hut, a canvas tent with a wooden floor. I slept on an elevated wooden bunk in the far, rear, corner of the tent. With younger boys accompanying us on this trip, we kept the wood stove burning through the night. However, where I slept, the overnight temperature was approximately 15 F (-9 C). I was warm and slept comfortably all night long. I did not even wake once during the night. I left the stoking of the fire to the others. On my next trip into the Kelly Canyon Nordic Area, the temperature was slightly warmer at 0 F (-18 C). This time we did not keep the fire burning through the night so the inside temperature was nearly identical to the outside temperature. I slept on the same elevated bunk. Once again, I was comfortable all night long. I am very impressed with the comfort and softness of this pad. The nylon cover is large enough to accommodate most any thickness of a self inflating pad being used in conjunction with the memory foam pad. �	The fabric and seams have performed very well to this point. The fabric seems to repel water so not to become water soaked. The memory foam has held up very well. There are not any cracks, tears, or peeling of the foam. �	During all of the field tests, I have used the Big Agnes provided Hinman pad in conjunction with this memory foam pad system. The total pad thickness is approximately 2 .5 in (6.4 cm). �	During the field tests, I rolled the memory foam pad, including the 1.5 in (3.8 cm) self inflating pad, together having both pads in memory foam nylon cover. After compressing the pad multiple times, it seemed to quickly return to its original thickness. �	The soft, slick texture of the fabric is a little difficult to roll-up and maintain in a compacted roll. I will use this pad with a conventional sleeping bag to see if I slide off during the night. �	The zipper is long enough that I can easily insert a self-inflating foam pad. It has functioned very well without getting hung up on the fabric. �	Overall, during all the field test temperatures I never once felt any cold coming up through the pad. When I initially saw the memory foam pad, I was a little skeptical about the weight; but I think it is worth the extra weight for the amount of comfort gained. This has been one of the most comfortable pad systems I have used. I have been very pleased with the memory foam pad. This concludes my Field Report. Please check back in approximately two months for additional test results. During this phase of the test, I slept on the Sleeping Giant Memory Foam Upgrade Kit an additional night. The memory foam provides a conforming layer that is warm and comfortable. 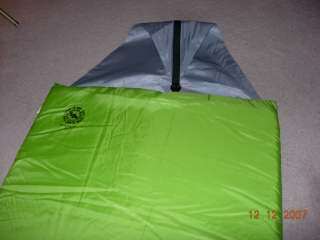 Once again during my LTR test period I used the Sleeping Giant Memory Foam Upgrade Kit inside my TNF Trek Bivy shelter. When I went to bed the temp was around 20 F (-7 C). When I awoke, the wind was blowing strongly and the temperature was 30 F (-1 C). On my latest outing, I slept very soundly with the memory foam in conjunction with the BA Battle Mountain. I tossed and turned throughout the night, sleeping on my side and back without any discomfort. I was cozy and warm throughout the night. I did not experience any colds spots in the hip and shoulder area where I compress the pad. I have compressed this memory foam multiple times during the course of this test. It compresses easily and continues to loft well. I really like the memory foam layer. It is soft, warm and enhances my comfort. I like the fact that it can be used in conjunction with other pads of varying thickness depending on the conditions. The system is flexible enough that, based on the conditions, the overall weight may vary from light to heavy. The zipper and buckle continues to operate smoothly. I have not had any problem with the zipper hanging up or snagging the fabric. The length of the zipper is more than adequate when inserting a secondary pad. The fabric has not developed any pilling, snags, nor has is become soiled. The main complaint that I have relates to the access to the valve. The fabric becomes lodged under the valve cap, when adjust the air level. Overall, this is a comfortable nicety, and has been great for winter yurt trips, where pack weight is of lesser concern. However, I am reluctant to carry the added weight on a typical summer backpacking trip. This concludes my Long Term Report. I would like to thank Big Agnes and BackpackGearTest.org for the opportunity to test the Sleeping Giant Memory Foam Upgrade Kit.